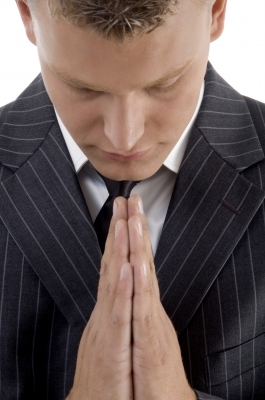 The Devine Write: Why Do You Pray? This post began as a question from a previous post--Questions About Prayer. The first question that arose is, "Should I Pray?" For this post, I want to pose another question to those of you that spend time in prayer. Many Christians live rather monotonous lives comprised of routine, tradition, and ceremonialism--even in their personal lives. It's called "going through the motions." This trickles into one's prayer life and turns a method of communication into a dry, cardboard-like regimen of catch phrases, Bible lingo, and other pseudo-Christian terminologies. This can all be summed up in "talking the talk." This is especially true in public prayers, where seasoned Christians practically memorize what they will say and say it almost exactly the same way every single time. Jesus had something to say about that. 1. Don't pray to impress God. God is not impressed by anything you can say, any eloquence you have, any memorization you've acquired, or any lingo you've learned. God will not decide whether to answer your prayer based on how well you execute your verbiage. If you're like me, you've subconsciously thought that "good prayers" are well-articulated, grammatically correct, and properly punctuated. Perhaps I even need to strain my voice a little to let God know I'm serious about it (sarcasm). Yes, God is listening; and yes, God cares about what you say. But in prayer, He is already staring into your heart and seeing everything that is there. Matthew 6:8 For your Father knows what things you have need of before you ask Him. He knows if you're genuine. He knows why you're praying, and if you really care. He knows if you're praying for selfish reasons or selfless reasons. Hebrews 4:13 All things are [uncovered] and opened unto the eyes of Him with whom we have to do. 2. Don't pray to impress people. Matthew 6:5 When you pray, you shall not be as the hypocrites are! For they love to pray standing in the synagogues [or churches] and in the corners of the streets, [so] that they may be seen of men. Truly, I say to you, they have their reward. Did you catch the irony of that? Jesus said, "If you pray with the intention of impressing people, you might impress some people. But that's all you'll get." In other words, your prayers won't be answered. You won't get any substantial blessing from your prayers. Your reward is to impress people who are gullible enough to be impressed by such hypocrisy. Jesus had a way of laying the smack down on pride and arrogance. And these verses definitely convict me! There's another no-no that I've learned about in my prayer life. It's one of the hardest issues to discern, in my opinion. Do not pray for selfish reasons. James 4:3 You ask [or pray] and receive not; because you ask amiss, that you may consume it upon your lusts. If you have a prayer list, start crossing off all the items that benefit you. Is anything left? I did this once, and it floored me. Now as I hinted at, there is some discretion to be applied here. I'm NOT saying it's wrong to pray for something that is good for you. For instance, God instructs us to pray for wisdom (James 1:5). Wisdom is good for me. It helps me. However, I often find myself praying for money so that (ultimately) I can get more stuff for me and my family. I often end up praying for my circumstances to be easier, or more convenient, or less stressful, or whatever. It's often something that makes me happier. I'm not saying it's a sin to pray this way. But I think it's revealing to me as I consider my own heart. Why am I so consumed with my needs, rather than the needs of others? As I mature, perhaps my prayer life will become more centered on the needs of others and on the kingdom of God. Matthew 6:33 But seek first the kingdom of God, and his righteousness; and all these [material] things shall be added unto you. Perhaps the reasons that Christians lose faith in prayer is because their prayers never get answered. And perhaps they never get answered because they continually pray for all the wrong reasons. Lastly, this post wouldn't be complete without the mention of one more unpopular message. Prayer is hindered by your sinfulness. Psalm 66:18 If I regard [or cherish] iniquity in my heart, the Lord will not hear me. You and I both have the tendency to want to do as we please and expect God to give us answers to prayer. We ought not be surprised when God does not answer. Sometimes He has been speaking to us clearly about sin in our life, but we ignore Him. So He ignores us. Does that mean I need to be perfectly sinless to get my prayers answered? But if you have known sin in your life, don't expect God to answer your prayers. And don't play stupid! Remember Hebrews 4:13? God sees everything in your heart and mind. He knows the games you play, the rationalizations, and the explanations for why your sin is "different." It's not different. It's sin. Amen ! Our selfishness & unthankful spirit greatly hinder our relationship with our Savior, & our prayer life suffers.